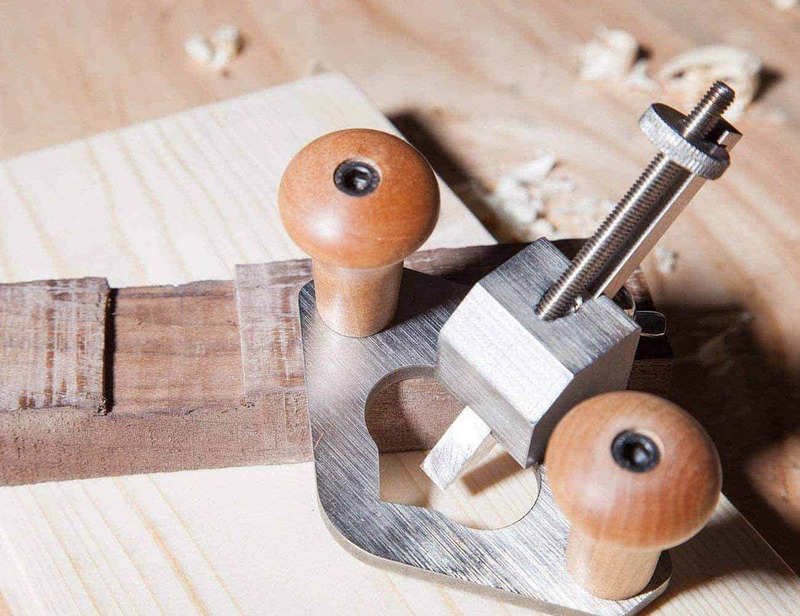 We’ve bought and compared five sanders and included some more helpful information for the next time you need an extra-smooth finish on your woodworking project. How Do You Use a Belt Sander? How Do You Put Sandpaper on a Sander? What Kind of Sander Do I Need? 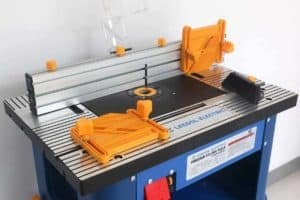 What Is a Belt Sander Used for? Sanders are versatile tools that can be used for a wide variety of projects around the house and in the workplace. 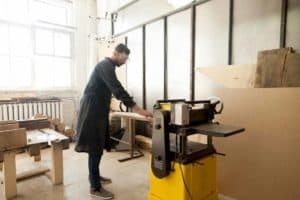 Whether it’s woodcutting, trimming work or cabinet and furniture making, you’re likely going to need a sander. 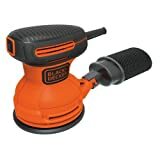 First on our list is the Black & Decker BDERO100 Sander. We chose this model because of its positive consumer reviews, Amazon Choice designation, affordability and reputable brand name. What’s all the fuss about? Let’s take a look. Using the Black & Decker BDERO100 is a breeze thanks to its easy-to-use design and functional user’s manual. The random orbit action provides a high-quality and smooth finish and easy debris removal, while the effective hook and loop system assists with quick and effortless sandpaper changes. The BDERO100 is the first orbit sander to have a built-in dust-sealed switch that removes all dirt, dust and debris from the model. The handheld sander is approximately five inches in length and is dual-powered by a 5-ampere battery and cord. Additionally, it has a push start that initiates the beginning of a smooth rotation that works continuously throughout the sanding process. There isn’t much to dislike about the Black & Decker BDERO100 sander. It’s easy to use, affordable and is a viable option for those who have been working with sanders for years, or someone using one for the first time. The hook and loop system was one of our favorite features and made it easy to switch out the paper so we could get back to sanding quickly. It’s a definite time saver. The price of the Black & Decker BDERO100 alone is enough to ignore what few cons we uncovered while experimenting with this sander. However, we noticed that it has large-grit sandpaper which removed some paint from the wood, and we didn’t like that it seemed to take more time to sand than more aggressive belt sanders. 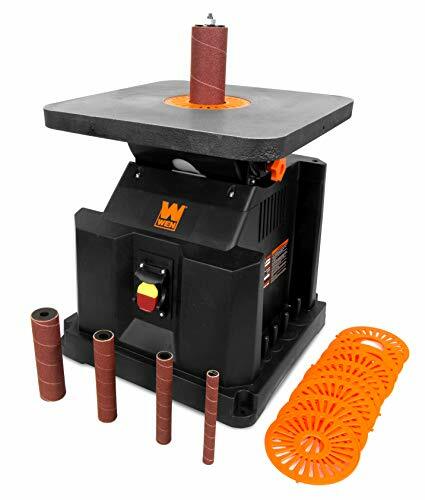 When it comes to woodworking, WEN has produced a wide range of products that have been at the top of consumer’s favorites lists. The quality and effort that goes into their products are just two of the reasons why the WEB 6510 Oscillating Spindle Sander has made it onto our list. As an Amazon Choice and a top seller, there was no way that we weren’t going to take a closer look at one of the top power tools and spindle sanders on the market. The WEN 6510 weighs in at approximately 35 pounds and has a compact design that makes it easy to store. It has an impressively powerful 3.5-amp motor and a speed of 2000 RPM, while its oscillating speed is 58 OPM. The unique design and no-load functionality make it easy to sand incredible finishes on angles, curves and other shapes that can’t be reached with a regular sander. Also, it has an included dust port that enables you to attach dust collectors to help with airborne particles. Includes six 80-Grit sanding sleeve sizes for a variety of curvatures: 1/2 in., 3/4, in., 1 in., 1-1/2 in., 2 in., 3 in. One of the key selling points for us apart from the great reviews, price tag and company reputation was the two-year manufacturer’s warranty that comes with purchase. Additionally, we found that the motor was very quiet, and the sander could handle a lot of use without slowing down. Throughout our use, we found that this sander was capable of sanding down any surface we needed for home and DIY projects. When using the WEN 6510, we found that it’s great for home and DIY projects of low to medium size but struggled with larger projects and wouldn’t be great for professional use. We also weren’t crazy about the majority of the parts being made from plastic. We also noticed that the small drum surface and high rotation speed caused the machine to overheat when used for extended periods. Moving onto the third option on this best sander of 2018 list, we’re looking at the Bosch Random Orbit ROS20VSC Sander. Bosch is known all over the world for their power tools. Their reputation, affordability and customer reviews are some of the reasons why this model landed on the list. We’ll take a look at product highlights, what we liked and didn’t like as well as pros and cons to make it clear just why this model deserves to be on our list. Keep reading to find out more. The Bosch Random Orbit 5 Inch Sander is powered by a 2.5-amp motor with a variable speed that runs between 7500 and 12,000 OPM (orbits per minute). On this model, the rate gets controlled by an easy-to-use dial. Bosch used the hook and loop design with the sander which keeps the sanding discs firmly in place. The sander works off of 120 volts and is a corded model. Also, the sander was designed with comfort, ergonomics and safety in mind. The material used to construct the handle along with the shape help to minimize vibration and keep your hand from cramping with prolonged use. EASY DISC ATTACHMENT: Through Bosch's signature Hook and Loop disc attachment system, sanding pads stick to the hand sander, acting like a Velcro-adhesion material. There isn’t much to dislike about this model. We found it very easy to use and the user manual that came with the sander was easy to follow and clear. The dust collection is an excellent addition to the sander and it works quite well. It is quiet, has limited vibration and after hours of use, there wasn’t any cramping in the palm. While the Bosch Random Orbit Sander is well worth buying, there were a few things that we would change if we had the opportunity. The dust collection works fantastically well but the container fills up very quickly and needs to get emptied often. Also, we would have liked Bosch to have included more than just one sanding disc for the sander and we did notice some sticking with the on/off button. Makita is another well-known brand name in the power tools niche, and we wanted to compare it against all others to see if it ended up as our choice for the best sanding tool. Exceptionally positive consumer reviews, a strong company reputation and a broad range of features made adding this model to the list a simple choice, but how did it compare to the rest? The Makita BO5041K has a compact design but a powerful 3-amp motor and a variable speed that ranges between 4000 and 12000 OPM. It has an easy-to-use dial that’s placed on top of the handle so you can quickly adjust the speed. The plastic body is designed for durability and the rubber-coated handles make using the sander smooth and comfortable and it comes with an extra handle. 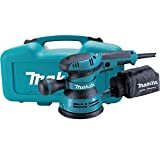 Makita included a pad control system to assist with controlled speed that’s designed to reduce gouging in the surface, and it has a trigger switch that makes starting and stopping convenient. The included hard-shell case makes carrying the portable sander a breeze and the integrated cooling system is engineered in a way that keeps your sander for years after purchase. 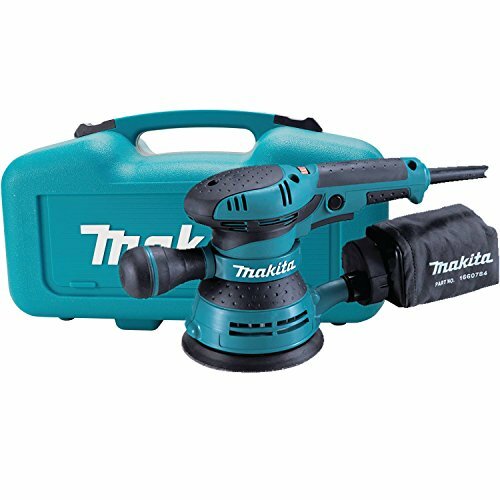 The Makita model is full of features that make it a must-have for anyone looking for a portable sander. We adore the affordable price tag and the safety lock that’s positioned near the on/off trigger switch. We also found that there was minimal vibration and it was very comfortable to use. When purchasing a sanding kit, we would expect there to be an adapter to attach to a shop vac for dust and airborne particles, but this kit didn’t appear to have one. It’s hard for us to think of it as a complete kit when that’s missing. Also, we found that the dust collection with the included dust bag was rather weak, and to get any use out if it the sander needed to be set at a higher speed. There are many sanders available on the market, so we hope that our recommendations make it easier for you to decide. We’ve come to our last sander on our list, the Tacklife 3.0 Amp Random Orbit Sander. While it’s not as well-known as some of the other brands on our list, it’s a top Amazon seller, has an affordable price and fantastic customer reviews. Let’s take a look at why we included it on our list. 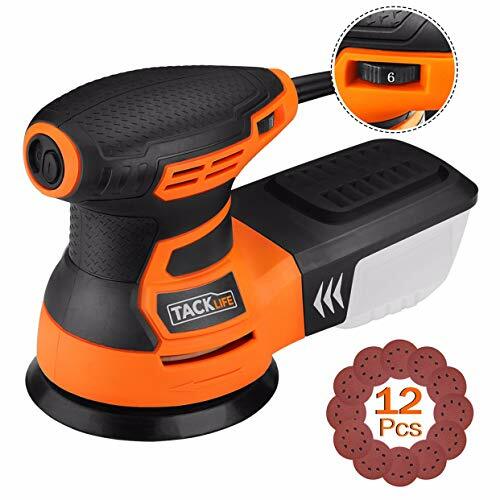 The Tacklife sander has an impressive 3.0-amp motor with a variable speed that runs up to a maximum of 13,000 OPM, all depending on the application. It has an on/off paddle switch that’s conveniently located near the top of the sander and can be quickly pressed with the pressure of your hand, and you have the option of locking it into place. Included with the sander is a 5-inch pad that helps you get a beautiful finish on your project in a quick amount of time. 【Strong Applicability】 6 Adjustable speed dial supports you to monitor the exactly right speed according to different work; 3.0A (350W) /13000 OPM motor offers strong power, It can work 13000 orbits per minute comparing with traditional manual grinding. 【12Pcs Sandpapers】 Supplied Sanding Discs 5-inch 12pcs (6Pcs X 80 & 6Pcs x 180 Grits) lasts the sander a long service life and meet your different applications of removing paint from wood, metal, plastic of corners and other hard-to-reach areas. 【High Performance Dust Collection】 It provides a clean work environment with a compact size and ergonomic design. This sander can get into tight spaces easily and meet maximize user control, the ideal for the DIY homeowner. 【Efficient and Comfortable Design】 Rubberized palm grip design for improved operator comfort and control; Located at the top of the sander, the switch is activated by pressing down naturally with the palm of the hand as if the sander is in use. 【Ideal for Indoor Work】 Precision engineered all-ball bearing construction for reduced vibration and noise, the machine works stably with low vibration, low noise, ideal for indoor work. Not suitable for wall sanding, dust of the wall is too thin to block the collecting system, dust is easily diffused, can't achieve the desired dust collecting effect. We found that using the Tacklife sander was a pleasure. It was comfortable, easy to use and made finishing up home projects a breeze. The sander itself was quiet and we didn’t notice much vibration coming through the rubberized handle. The cost of this sander is a significant selling point. Unfortunately, the power cable on the Tacklife sander is too short for natural movement. It’s under 7 feet, which doesn’t provide a lot of length to move around. We also noticed that the dust collection box vibrated with use and fell off. While it does have a 30-day refund policy, keep in mind that this isn’t a sander we would recommend for large projects. Sanding might not be the most exciting part of woodworking, but it is a necessary part. 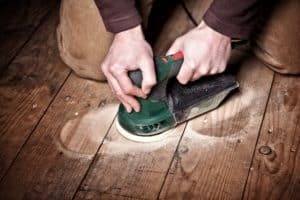 After putting in so much work with your wood project, it’s likely that you will want to make sure it’s as smooth as possible and you need a sander for that. However, what do you do if you don’t know what to look for in a sander? 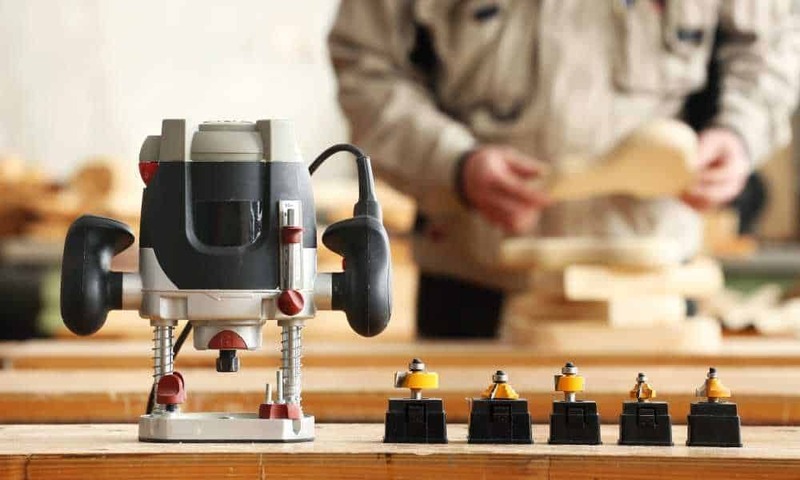 We’ve created an easy-to-follow guide to help woodworkers of all experience levels understand what to look for when purchasing the sander that’s going to give your project the best finish possible. Let’s get started. You might be surprised at the range of sanders that are on the market. You can find them in a variety of sizes and some are corded while others are cordless. There’s no right answer when it comes to the power you choose for your sander and it all depends on what you’re using it for. All you need to do is honestly think about what you’re using it for, and you should be able to get your answer. If you are going to be using it professionally, you should look for a sander that has enough power to run an industrial sander, but if you’re using it at home, you shouldn’t need anything with industrial strength. 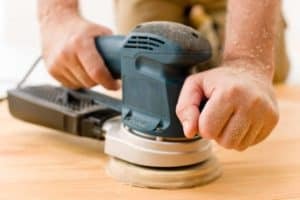 The shape of the base plate that you purchase for your sander is going to depend heavily on the type of sander that you’ve purchased. Before buying any additional plates, it’s a good idea to look through the owner’s manual that comes with your specific model to see what is recommended. If you’re using an orbit sander, there’s a good chance that it doesn’t require the same plate shape as the random orbit sander that you have hanging in your workshop. If you need additional assistance, you can always ask the associate at the store you purchase your sander from. There are typically three types of sanding motions when it comes to sanders and understanding how they work is going to help you determine what type of sander it is that you need. Orbital motions move in a small circle that causes each sandpaper grain to move along with it, while belt plates move in one direction. Any scratches that come from belt plates are in the same direction of the belt in question. The third is rotary plates. The entire sanding disc spins around and the outer edge of the disc moves faster than the center, so various levels of sanding are achieved. When using a sander, you want to ensure that your hand is comfortable throughout the duration. You might not realize it, but the prolonged use of a sander with inadequate comfort and ergonomics could damage your hands and wrists and cause exhaustion. The excessive vibration that comes from sanders should be minimized with a soft, thick rubber that covers an ergonomically correct handle. If possible, try out the handheld sander you’re considering before purchasing it so you can ensure it’s comfortable enough for your use. There are three primary types of sanders, and the one you choose should depend on the kind of work that you’re going to do. Belt sanders are recommended for large jobs with a vast area of space that needs to get covered and are mostly used for tabletops, doors, counters and even stripping surfaces of old paint. Orbital sanders provide smooth finishes on large and flat surfaces and are ideal for smoothing things such as plaster, varnish and paint. Lastly, there is the random orbit sander. These sanders have rotating discs and provide beautiful, scratch-free finishes. They have the speed of a belt sander with the finish of an orbit sander. Using a belt sander is quite simple and straightforward and there isn’t too much involved with it. You should start off by preparing your wood and making sure that it’s secured to the table so you don’t risk it slipping. 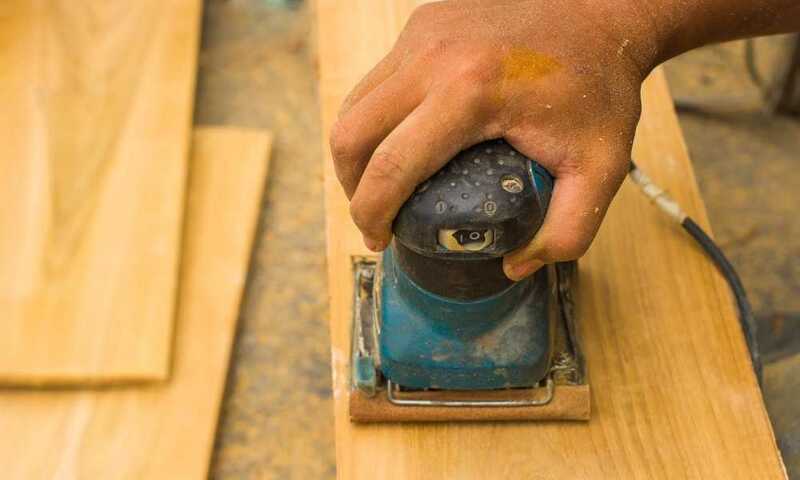 Belt sanders in particular can kick up a lot of wood chips and specks of dust when used, so you should ensure that you wear protective goggles and gloves before you begin sanding. To find out more information about how to use a belt sander, we’ve included an informative YouTube video that provides you with everything you need to know to start using your belt sander. There are a handful of different ways to add sandpaper to your sander, and how you should do it will depend on the type of sander that you’re using along with the grade and grit of paper. The majority of sanders have a clamp that you can lift up to remove the old paper and slide the new paper in. However, to make sure that your sander performs in the same way, you should consult with your owner’s manual to ensure that you’re changing your sandpaper correctly before turning the sander back on. Orbital sanders are easy-to-use, lightweight, quiet and ideal for hobbyists and home users. These types of sanders don’t typically get used for heavy projects and are designed to provide an ultra-smooth finish to the wood. Additionally, orbital sanders are used to accurately round out sharp edges, knocking off coats of dried-up varnish and paint and for sanding off putty and plaster. The sanding pad works by vibrating in tiny circles (orbits) that allow you to sand in any direction. The type of sander that you need will depend a lot on the project that you’re working on. If you’re working on a project that covers a large amount of space such as a floor, wall, door or tabletop, it’s recommended that you invest in a belt sander. 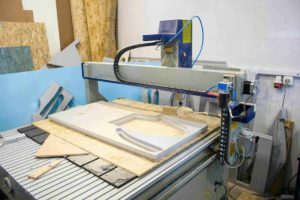 If your project is more delicate and you require smooth, flawless finishes with rounded corners, an orbital or random orbit sander that enables you to sand in any direction could be your best bet. Under most normal circumstances, belt sanders get used for industrial sanding and large-surface sanding. They work great on tabletops, floors, walls, doors and other surfaces that require a significant amount of sanding in a short timeframe. 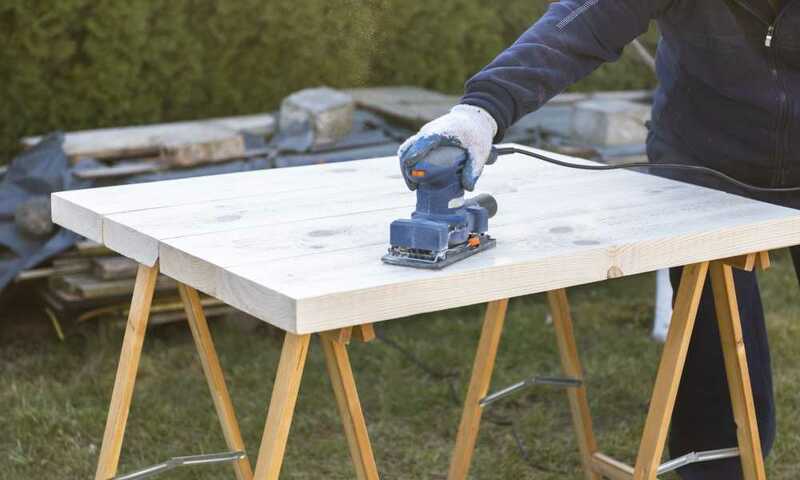 Belt sanders are also recommended when you need to sand away layers of old paint and varnish that are stuck to the surface of the wood or material that you’re working with. After testing out and comparing these five different sanders, we were able to decide what our number one choice would be. We looked at variables such as customer reviews, cost, brand reputation, features, functionality, comfort and others to determine the model that we think is best. The Makita BO5041K 5-Inch Random Orbit Sander Kit has slightly subpar dust collection, but that’s not a big deal considering everything else it offers. The ergonomic design, lack of vibration, durability and stunningly smooth finish can’t be denied, which is why it’s our choice for the best sander of 2018.